Coming in November from LRP, the new GT-3000R!!! You thought you knew everything about batteries ??? The Powers GT-3000R cell outperforms everything on the market by far!!! We adapted our HiVolt-Plus- as well as our computer-matching-machine to this new NiMH-cell and decided to use a 30 ampere discharge current for the first time and this standard will be used for all future batches we produce. The 30A-rate gives more accurate numbers for the new generation of cells and is closer to the actual discharge current in the car than the previously used 20.0A. Expect 15% more runtime than on the known Panasonic- or Sanyo-3000 cells ! 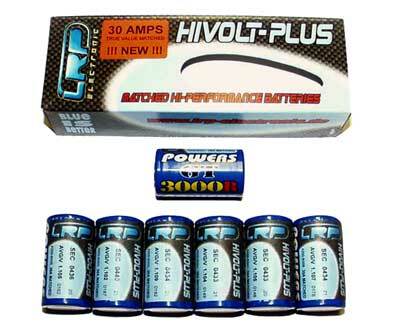 We talk about more than 3300mAh's real capacity at 30.0A discharge current!!! Voltage and Punch is much higher than on the Panasonic P-3000 and very close if not equal to the Sanyo RC-3000H!!! We're the first manufacturer in Europe that introduces this cell and we'll have the first batch of cells ready end of November, better pre-order early to make sure you get one of those unbelievable packs. This new packs replace our known Panasonic-3000 cells which will be discontinued! LRP-cells now 30A True-Value Matched!!! As part of our never sleeping development we recently upgraded our custom-built computer operated battery matching equipment to measure all cells with 30.0A ! This gives more accurate numbers and is very close to the actual discharge rate in the car. We also adjusted our machines to our new "True Value" system, which contains high-tech contacts and digital circuit for zero-losses at the contacts, no fake numbers or multiplication factors just how the cell performs in reality!!! This new system has just been implemented this week and all our newly matched cells will have 30A numbers instead of 20A. As you can see in the above list is the Panasonic-3000 cell discontinued, we'll no longer match this cell due to the better performing Sanyo- and Powers-cells. We're proud to present you our latest competition Speed-Control, the Quantum Competition. Our design-team spent a long time on research with new components and techniques and testing with our factory drivers all around the World to give you the best possible Speed-Control. The world's winning design (3 titles through David Spashett at the On-Track World's in England) contains all the latest design features and components and has been optimised for the use of the new battery generation. • Smallest and lightest competition Speed-Control on the market !!! 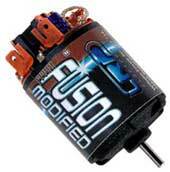 • Lowest internal resistance for minimised losses and maximum power to the motor. • External solder tabs for easiest change of power wires. • LRP's revolutionary "D.E.M.S." (digital engine mapping system). • 100% digital circuit with two push buttons and LED's for simple programming. The Quantum Competition has three different modes which are "Punch Control", "Initial Brake" and "Automatic Brake", these modes allow you to adjust the Speed-Control to your needs. Punch Control contains our revolutionary "D.E.M.S." (digital engine mapping system) which allows you to adjust the punch to your specific needs and which replaces the simple systems such as current lim-iters or variable frequencies. Initial Brake allows you to adjust the minimum brake as soon as you touch the brake trigger. This is now independently adjustable from "Automatic Brake" and more precise than on any other ESC. Automatic Brake allows you to adjust the amount of brake while you're on neutral position, this gives more steering to your car for faster cornering. This is now independently adjustable from "Initial Brake" and more precise than on any other ESC. Technical specifications, additional features and more will follow soon on this website. The new Quantum Competition will be available in your local hobby shop end of November, so make sure you pre-order it to guarantee a supply of the first batch. The suggested retail price hasn't been de-termined yet. Now available at LRP, the improved Sanyo RC2400-SP cells! This new NiCd-cell has a much lower internal resistance than the old-type RC2400 which results in a higher average voltage of the cell. To our own surprise Sanyo engineers also managed to increase the capacity of the new RC2400-SP, which allowed us to raise the minimum discharge seconds of our top-of-the-line HiVolt-Plus packs to 450secs which gives you 10secs extra at the same price!!! The old RC2400 is no longer available since we ran out of stock, the new cell replaces this completely and has the same order-no. 76120. 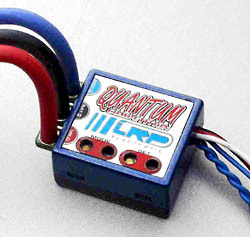 We recommend the new RC2400-SP for all Off-Road classes and series with controlled motors. All cells are HiVolt-Plus treated on LRP's unique machine for best performance and the suggested retail price for the RC2400-SP HiVolt-Plus cells stays the same at DM 179.90 (German Retail price).